Brooklyn’s Green-Wood Cemetery is full of beautiful, intricately carved monuments. But one so impressive, it attracted thousands of visitors in the 19th century was that of Charlotte Canda. The daughter of an officer in Napoleon’s army who was the headmaster of a school on Lafayette Place in Manhattan, Charlotte met an especially sad, dramatic end: On the night of her 17th birthday, in February 1845, she fell out of a moving carriage on Broadway and Waverly Place, hit her head on the pavement, and died. Her grief-stricken family commissioned a massive marble monument in Green-Wood Cemetery with all kinds of Victorian-era touches: Charlotte as an angel standing under a canopy, with church-like spires, carved flowers, and two more angels flanking her tomb, among other flourishes. Because it was so ornate, her monument was a popular place for strangers to visit. 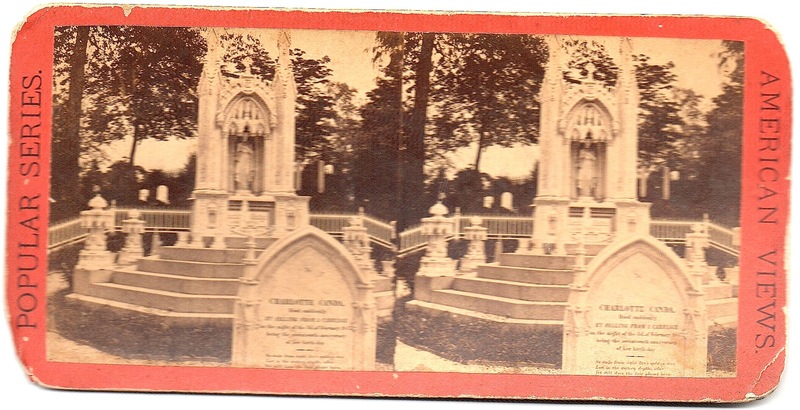 So popular, in fact, a photo of it was made into a trading card as part of what appears to be a series of Green-Wood Cemetery cards. Sounds pretty ghoulish, but late 19th century New Yorkers used to picnic at the cemetery, so it fits with the sensibility of the era. Here’s what her tomb says about Charlotte. To add to the Victorian drama of it all, her fiance, a French nobleman, killed himself after Charlotte died. He’s buried in a plot next to hers. Green-Wood Cemetery has better photos of her monument and more detailed information. This entry was posted on November 24, 2008 at 4:12 am and is filed under Brooklyn, Cemeteries, East Village, Music, art, theater. You can follow any responses to this entry through the RSS 2.0 feed. You can leave a response, or trackback from your own site. Some words about Charlotte Canda’s fiance (in french) here : http://blog.pinsonnais.org/trackback/314638…. Just and aside, which I haven’t seen verification for; Miss Canda’s remains were removed to Calvary Cemetery in Queens in the late 1800’s. The monument that is still in Greenwood was petitioned to be removed also, but the request was denied. Maybe the Greenwood historian would have more info. I didn’t know this; Greenwood is listed as her final resting place in many newspapers and other sources. If anyone has more info, send it in! I am a Historic Researcher and Tour Guide at The Green-Wood. Those “trading cards” are called stereoscopes which were very popular during the mid-1800s. They took a very special camera to use and the exposure time was almost an hour for each 2-image shot. The cards had two images that looked almost the same yet where slightly askew of each other. A person would take the card and put them in a holder (sort of a Victorian-era- Viewmaster) or in a cabinet made for that purpose (stereo viewers)—look into the eyepiece and the viewer would get a three-dimensional image of the photo! The cemetery archives contain over 100,000 stereoscopes regarding the inhabitants. The move to Calvary never happened. It was more rumor than anything. 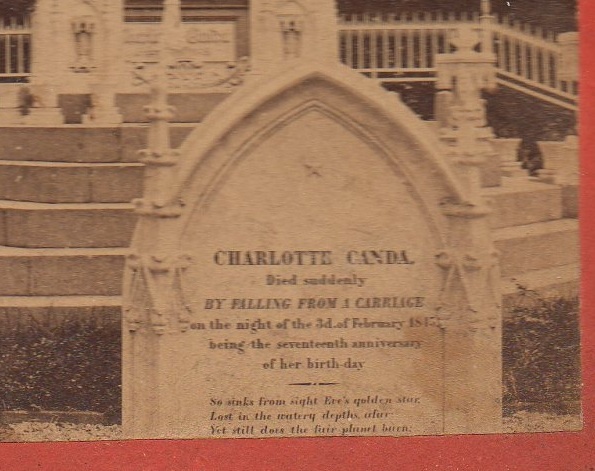 Charlotte was actually first interred at The Old Saint Patrick’s Cathedral on Prince Street and was interred at Green-Wood in 1848 while her monument was being built. From what we know that move to Calvary was never intended. I think all gravestones should list the cause of death…RIP Charlotte.